Which message board is better, Freeforums or Facepunch? [I]"What the hell are we doing down here?" "You're doing what I told you to do! I told you to go down here!" "No seriously, these are not humans we are allying with and unless I am very much mistaken there are quite a lot of humans on the other side of that hill in the direction in which we are pointing our guns." "We have to teach those Facepunch bastards a lesson! We'll show them what for!" "I do not know what that means and we are going to be executed for heresy." "Freeforums forever! Crush these outsider upstarts!!! They can't get away with crticising our subforums like this!!!!!!!!" "Oh God, she's gone insane and she's taking us all with her." "Ugh, whos idea was it to travel hundreds of miles from our cities into the middle of nowhere to fight things that have many times more technological superioty to us?" "Um? The Popeling my liege?" Two helicopters filled with men (10 in higher one and 5 in second) fly towards the freeforum base. ''Men, today we prove ourselves. Let's send those freeforumers back to where they came from!'' The captain yells. The drones chant into their Vox links, instilling the vigor to fight, and to win. We totally need flying flags. A truckload of Techsoviet personnel arrive in the cave. It's best not to ask how they got in with the truck because it involves wizards and you're not supposed to tell people how magic tricks are done. A soldier gives a short speech from the bed. "Comrades... Today we fight an usual fight. Not a fight for control, for order or for the good of our people. Today we do not even fight for ourselves. An alliance, perhaps not known to us all but forged many years ago between unlikely armies of this Galaxy. An alliance of the true and worthy, formed out of necessity against a growing force in the lands of all our origin. A force of those unworthy of mention alone, but together a blight upon our very existence. Upon this neutral ground we fight for our supremacy not as individuals, not even of our Union but as the rightful collective of the Great Freeforum Alliance!" oh god. All glory to FP! BB-Henry, wrapped in bandages, stares at his IGOR through a holographic map. "We're allied with the Black Temple." "Do you know how screwed we are if they find out how much alien tech we use?" And high above, the Enforcer known only as Crimson Helm watches the approaching helicopters. Waiting for the time to strike. I suppose that it's my duty. Hive Mind: We will finally settle the score the Dace Punchers will go down once and for all. Assault Gunner: He's gone insane again hasn't he. Rifleman: Yup looks like it. 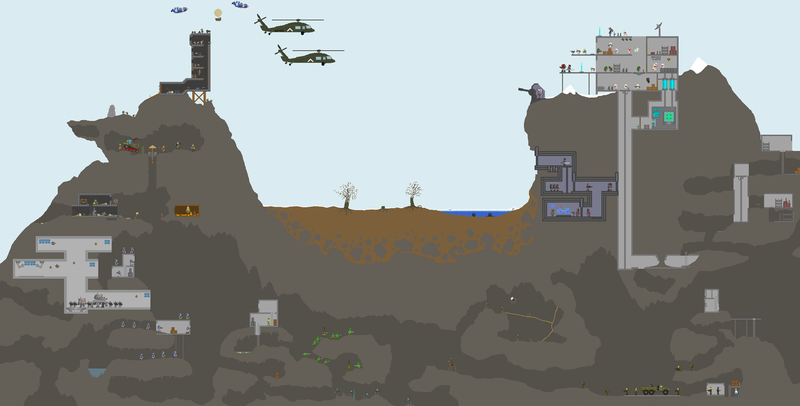 "We shall start here and build our base upwards underground, they'll never see us coming! For Facepu-"
"Who's idea was it to bring a dozer down here!?" The mechanical clanking of the bots programmed to fight in WW1 echoes through the tight caves, they are a bit late to the war - but still loyal and working as ever. Menacing officer bots standby ready to shoot anything that malfunctions, with their plasma gun right hand men right beside them. "In the name of Gayry! Down with the Kaiser! Kill, kill kill!" After being inactive for what seems like aeons on this barren planet a bunch of hyper advanced drones reboot after reports of activity in the area. One of them turns on a faint green light and heats up its systems to be able to actually move its robotic tentacle-like limbs. A team of five ants swarm from their home of the earth in aid of the fight against the freeforumers. Three special-operations ants which are fully equipped with quick-fire sniper-type weapons move forward as two assault ants follow closely, one deploying an ant-package barrier. Signalling to his brothers the leading ant informed the group of a possible target above him. A small outpost of the 31st Exploration Fleet begins to bustle with activity. Two Leon-5 Battle Drones and a soldier are sent forwards to support the spider... things. Filthy aliens, if command hadn't expressly said otherwise they'd be as dead as the Facepunchers. The truck was always an armoured mining tractor, to suggest otherwise would be treason. Against the wizards who did it. Minor air support is called in. Operation Rock Sandwich underway. The soldier fires at the enemy units on the ridge while the others start to leave the cave. Two eggs are laid and the hive mind senses the nearby humans and connects them to the mental network. Hive Mind: Greetings allies, good time for you to show up I sense many humanoids nearby.